Located in Scottsdale’s upscale D.C. Ranch, Eddie V’s Edgewater Grill’s dark ambiance offers a luxurious setting in which to enjoy a decadent meal. Executive Chef Brian Feirstein prepares a variety of dishes with French, Asian, Mexican, Italian, and good old Texan influences, individual to each dish. Recipes are brought to life with either fresh fish, flown in daily, or the finest Midwestern beef, from Allen Brothers Chicago. Eddie V’s feature’s an award winning wine list, and desserts as delicious as they are beautiful. Enjoy big dark booths and crisp white linens in the dining room, or opt for their exciting lounge with nightly jazz music. Either way, you’re sure to enjoy your meal at Eddie V's. The Arizona night sky is warm and crystal clear, with the stars shining visibly as we drive into Scottsdale’s tucked-away D.C. Ranch to Eddie V’s Edgewater Grill. The cozy, Western-chic area provides a far-away vacation feel, just minutes from the busy Scottsdale scene. The streets are small and primarily lit up by old fashioned strands of white lights and the glow of the upscale restaurants and boutiques that line the streets. We decide against valet parking, and go with one of the many open spots on the street. Eddie V’s is one of the three different restaurants owned by longtime friends Guy Villavaso and Larry Foles. Their other restaurants, Wildfish and Roaring Fork, are also great Arizona successes. All three restaurants also have locations in Texas. The head chef of Eddie V’s in Scottsdale is Brian Feirstein, an Arizona native who attended the University of Arizona as a pre-med student, but jumped ship due to his undeniable passion for food. He graduated from the Scottsdale Culinary Institute in 2002. We enter the restaurant and are immediately greeted by name by the friendly host who handles reservations. The entrance is large with glossy medium woods, and the walls are decorated with metal sculptures of fish. 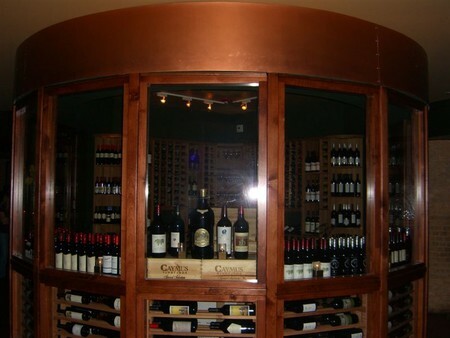 As we are shown to our booth, we pass a very large circular wine cellar, made primarily of glass. The restaurant is very dimly lit, and the decor gives off a ritzy hotel feel. In the dining room there are walls with brick pillars, and frosted glass with lights shining through. There are also dividers made of glass sculptures of whales, waves, and other aquatic scenes. There are large and small tables in the center, and different sizes of booths on the perimeter of the restaurant. All are set with crisp white linens and lantern-like candles. The noise level in the dining room is low, and the restaurant is relatively quiet. There are a good amount of well-dressed people dining here this evening. Most appear to be in their thirties, all appear to be stylish. The dress is nice casual. For women, a dress or dress pants and heels would be appropriate. For men, jeans, nice shoes, and a dress shirt would fit in perfectly. There are a few groups of friends enjoying the larger booths, and the majority of patrons are made up of couples smiling amid the glow of candlelight. While this evening we sit in the dining room, Eddie V’s offers outdoor dining, as well as a bar/lounge area where a live jazz band performs nightly. Eddie V’s can accommodate functions of up to 160 guests. As we sit down, our server immediately brings us our menus, and offers bottled or tap water. The menu is large: a thick black book with silver embossing on the front. We opt for Figi water. The award-winning wine list is as extensive as it is impressive. There are about 300 wines to choose from. And while the list is New World heavy, the variety is remarkable. I decide on the Rancho Zabaco Zinfandel. I find it very smooth and enjoy the low levels of acidity; its taste is uncomplicated. The dinner menu is equally as versatile. It focuses mostly on seafood, which is flown in fresh daily. The different culinary influences in the fish preparation are fascinating; the menu includes Asian, French, Italian, Spanish, and Texas-style dishes. The Steaks are all center cuts of aged, Midwestern beef, and are from Allen Brothers Chicago. There is quite a lot to choose from. We are quickly brought bread and butter. It’s a very good, light sourdough, perfectly crunchy on the outside, and soft and moist on the inside. We start by ordering the Kung Pao-Style Calamari, and the Sweet Corn and Crab Chowder. The calamari is large and delicious. Cuts of calamari steak are breaded in a light tempura batter and fried, then served with mixed Asian vegetables that are tossed in a soy-ginger sauce, topped with crushed red pepper and peanuts over a bed of fried rice noodles. The chowder is a flavorful, buttery combination of corn, bacon, carrots, celery, broccoli, and onion; an enjoyable and mild dish. The service is extremely attentive. The crumbs are swept from the table while our water is constantly refilled. The service itself exemplifies luxury. I follow with the Sautéed Lemon Sole in Parmesan Crust. 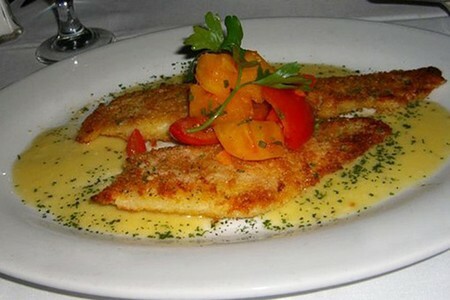 Two ample filets of sole are served on a large white plate, topped with a lemon butter sauce and chopped red and yellow tomatoes, all sprinkled with green flakes of parsley. The color combination is quite aesthetically pleasing. The fish is perfectly prepared, very tender and flakey on the inside, and the outside breading is delicately crunchy. The parmesan adds a mild and important flavor and texture. The sauce is rich, tangy, and buttery. The tomatoes are delicious in themselves, and add a much-appreciated lightness to this decadent entrée. My partner has ordered the Broiled Jumbo Georges Bank Sea Scallops. This indulgent dish—the scallops are wrapped in bacon—is also served on a large white plate, but topped with a darker tomato basil sauce. Both the bacon and scallops are very tender. The sauce is heavy and flavorful, very buttery with a small amount of tomato flavor and a hint of citrus. We follow up our meal with the Hot Dark Chocolate Godiva Cake, and the Cinnamon-Raisin Bread Pudding Soufflé. The Godiva Chocolate is a deep, dark-chocolate, melt-in-your-mouth soufflé. It is topped with a dark chocolate sauce and served with a sweet vanilla ice cream. The ice cream’s coolness and sweetness add contrast and depth to this cocoa-rich dessert. It is a perfect ending for a true chocolate lover. The Cinnamon-Raisin Bread Pudding Soufflé is gorgeous! Impressively high peaks of a light brown meringue tops a good-sized portion of bread pudding cooked in its own little soufflé dish. The bread pudding itself is a chunky combination of breads and apples, served with a side of sugary-sweet and potent bourbon-whiskey sauce. Eddie V’s does an excellent job of combining Western indulgence with upscale dining. We leave feeling that we enjoyed a rich meal in a luxurious and romantic atmosphere.